The Propex® II Apex Locator from Maillefer features a new generation full colour visual display for improved tracking of the files. It also has the latest multi frequency technology incorporated into this 5th generation apex locator and an extended apical zoom function, which activates when the file reaches the apical area, assisting the dentist to locate the apex in most types of root canal conditions. The Propex II apex locator has a small footprint and operates on a rechargeable battery, so it can be moved between dental surgeries with ease. 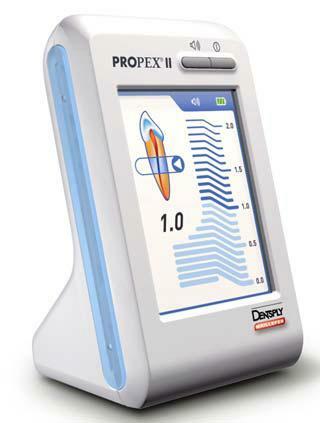 Click the button below to add the Dentsply PROPEX II Dental Apex Locator to your wish list.